It is sometimes possible to attract bats to roost in an area by placing bat boxes on walls, posts or tree trunks. 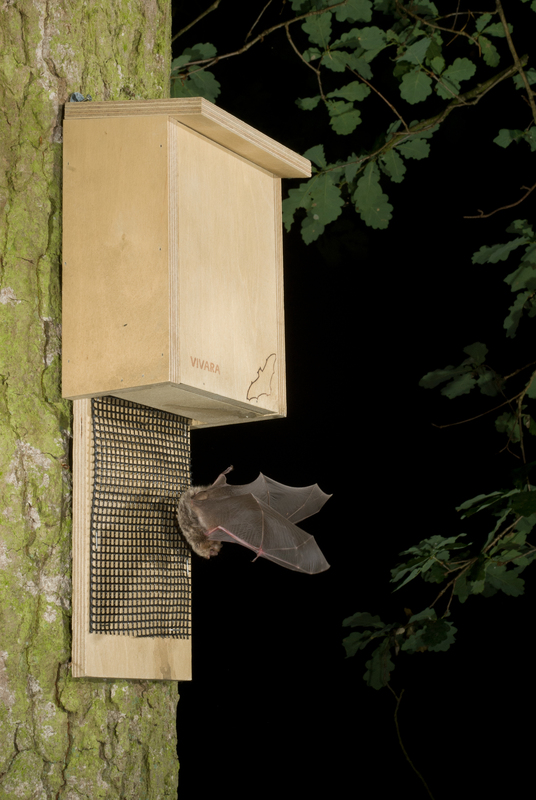 Bat boxes can create additional roosting places for bats where roosting options are restricted. Bats benefit a locality by controlling insect populations. Daubenton’s bat leaving bat box © Paul van Hoof. Bat boxes are usually constructed from wood or woodcrete (a composite material made from concrete and sawdust). They can vary in size from large scale multi-chambered constructions to simple wooden boxes very similar to a bird nesting box. In addition, bat bricks and tubes can be incorporated into new builds to facilitate roosting bats. Bat boxes usually have an opening at the bottom and the bat lands and crawls up inside. Our colleagues at BirdWatch Ireland sell the wooden bat box photographed above in their online shop. In Ireland, although maternity colonies are very occasionally found using boxes, they are generally used by small numbers of bats of a limited number of species. Bat species that are most regularly found using bat boxes are soprano pipistrelles, Leisler’s bats and brown long-eared bats. Other species are less common but all species, with the exception of the lesser horseshoe bat, have been found using them from time to time. Bat Conservation Ireland is currently unaware of any unheated bat boxes that reliably mimic maternity roost conditions in Ireland although this situation may change with new methods and materials. Bat Conservation Ireland has a downloadable leaflet with plans for making wooden bat boxes and another leaflet on using bat boxes on the farm as part of agri-environmental schemes.